Hi! Anyway we can get a class going in Utah?! Any chance of a clinic in the Northeast or Ontario / Quebec sometime soon? I was disappointed when the class in Las Vegas was cancelled in April, and I would still like to get over my fear of falling on lead. Hi Anneh, We had a clinic in Boston in July; no plans rest of this year for the Northeast. One option is to do individual training with one of our trainers, so you don’t have to wait for a scheduled group clinic. In other words, if you’re planning to go to Las Vegas, or somewhere where there is a ww trainer, then you can arranged training with him/her ahead of time. We’re working on offering training in more locations, so stay tuned. Thanks for your interest in ww. Hi. The list above shows a Jan 3 clinic at Rock n Jammin (Denver). They list it Jan 14. Rescheduled? Or is the list above from 2016? Thx! Hi Nicole, It should be Jan 3 for Rock’n and Jam’n #2. The trainer doing the clinic, Jes Meiris, has it as Jan 3. Call them to find out why they have it as Jan 14. Where on their site do you see it listed as Jan 14? I couldn’t find it. 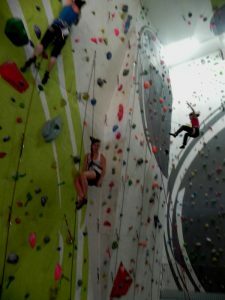 Do you teach the clinic for climbers who are NOT 5.9 climbers? I could really use the clinic, but I’m more a 5.7-5.8 climber right now. I can get up a few 5.9s, but sometimes I fall or hang. Hi Nicki, For the terrain we use and the effectiveness of the drills, it’s best if you can climb at least 5.9. Tell me a bit more about why you think the clinic will help. I can give some suggestions. Another option is to do a private session. Where do you live? I can put you in contact with one of our local trainers. Hi! Any idea when those Utah dates might be open to sign up for? Been calling those locations every now and then, they’ve yet to be integrated into the gym’s schedule. I very much want to get into one of these. Also, do you have a trainer in Utah? I live in Moab, I can travel to the Salt Lake area, oh and Grand Junction, CO is just down the road! Saturday 27th: Bear House Mt Guiding for outdoor camp: 803-351-2573. They’ll have a registration link on their website soon, but Derek there told me you can register by calling that number. The Front clinics are close to being confirmed.